Technically, spring extends for a couple more weeks. But can we all just admit that it’s June, summer’s here, and it’s time to drink as much German beer as humanly possible? We’re talking non-stop, every day from now until September — at which point we’ll need to seriously ramp it up even more through October! Bottom line is: You’ve got five straight months of Teutonic chuggery to plan for, and coincidentally the Shelton Brothers have a pile of brand-new, never-before-in-the-U.S. Deutsches kraftbier to spice up that party/picnic shopping list. The major breweries of Berlin phased out their local specialty, Berliner Weisse, just as renewed interest in it had kicked into high gear in the U.S. Thankfully, artisanal brewer Michael Schwab has revived the indigenous style in its home city (ja! 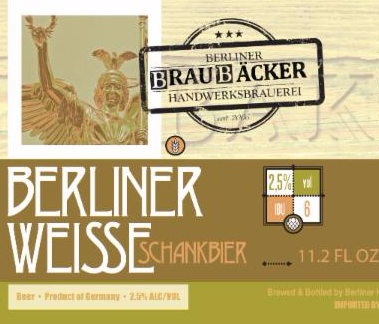 ), and done it truly old-school: his 2.5% *BrewBaker Berliner Weisse is triple-fermented, with Saccharomyces, Brettanomyces, and Lactobacillus. The result is a characterful, complex, funky, and hugely drinkable fruity quencher that surpasses the stuff once commonly poured in post-war Berlin — and you can leave out the syrup! There’s a belated-but-welcome beer boom going on in the German capital, and for us, this blessed revival is its most important development. *Please note that the U.S. version goes by the name “Braubäcker“! Braubäcker Berliner Weisse is available in 330mL bottles and 30L kegs. On the eastern-German border with Poland sits the sleepy town of Neuzelle, dominated by the ornate 400-year-old baroque church built on the site of a 12th-century monastery. The adjacent Klosterbrauerei Neuzelle has been in operation since the 1600s, when all beers were opaque, and our favorites have in fact been their dark specialties: the dunkel Badebier and wonderful Mord & Totschlag porter/schwarz hybrid. This century (in fact, this year) they’ve launched a brand-new beer, albeit one dedicated to an old style:Black Nun, an 8.1% imperial porter inspired by the golden-era English ales of the 18th century. 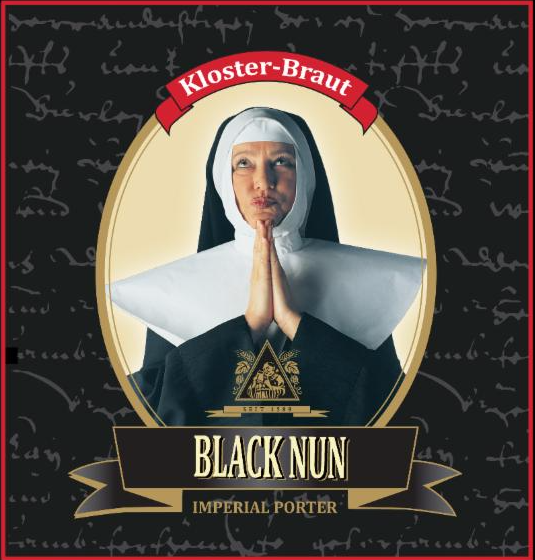 Along with a freaky, cynical-looking Germanic nun on the label, this formidable pitch-black brew features aromas of licorice, coffee, and chocolate, as well as just the right bitter and roasty flavors to balance out the liquid-bread maltiness typical of Neuzeller’s strong brews. Black Nun is available in 500mL bottles. Following the runaway success of Sebastian Sauer’s Freigeist, his offshootThe Monarchy has since 2012 been further reviving and tampering with lost German beer styles. His Methusalem, a treacherously drinkable 10% “Adambier,” has been the favorite — until now. 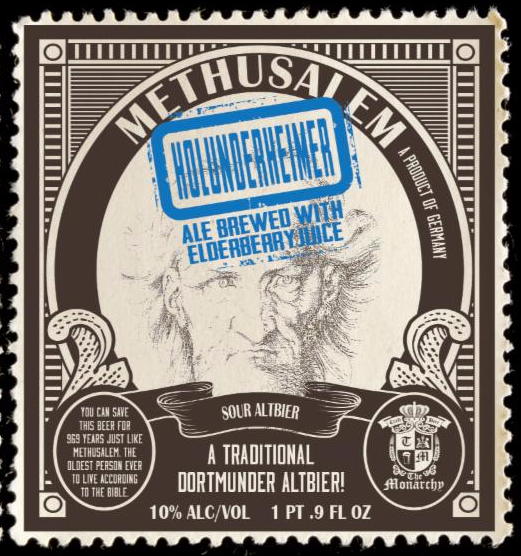 Using the Methusalem as their base, the Holunderheimer (brewed with elderberries) and Johannisburger (brewed with red and black currants) take the delicious and complex heavyweight to another dimension, adding strong fruit flavors to the slightly sour and smoky ale. Methusalem Holunderheimer and Johannisburger are available in 500mL bottles and 30L kegs. Lastly, we have a truly momentous announcement — our first non-alcoholic offering! We never planned to go into the soda business, but Hopster was just too good to pass up. This concoction — is it a sparkling water? a tonic? a soda? — is produced in Bavaria at the Kondrauer Mineral-und Heilbrunnen, which blends its award-winning mineral water with tea and lemon essence and a distillation of essential Hallertauer Traditional, Taurus, Perle, and Cascade hop oils. Its strikingly spritzy, fruity, and gently bitter aroma is followed by a dry, clean, lemony palate. Refreshing by itself, it’s also the perfect mixer, and an excellent non-sugary, non-alcoholic option for the hop-loving teetotaler or designated driver! Our first shipment of 865 cases sold out in two days. You’ll want this. 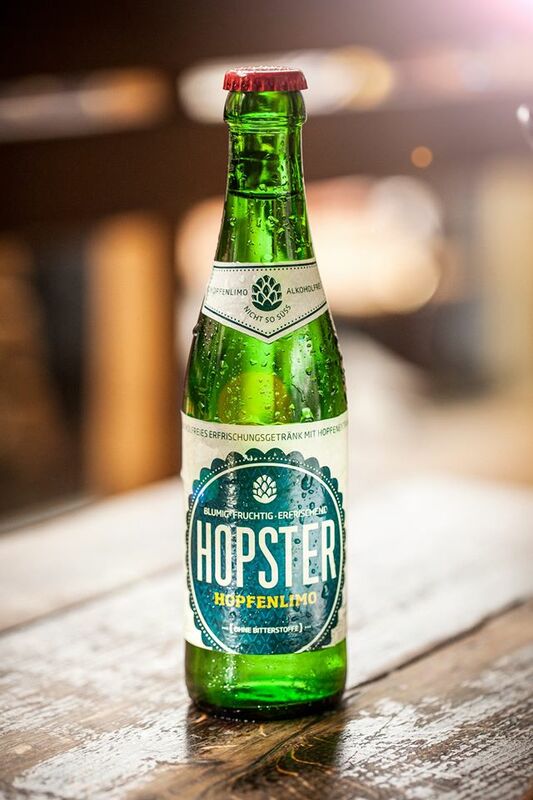 Hopster is available in 250mL bottles.